More personalized: Facebook's platform will be organized by themes and personalized the same way the News Feed is personalized — around family, friends and interests, to help users discover new content. Accessible on TV: It will be accessible via a TV app and multi-device as opposed to Snapchat which is mobile-only. Our thought bubble: From the TV/multi-device perspective, "Watch" seems like it could be more of a competitor to YouTube than perhaps anything else. It will include both long and short-form content and will feature a range of highly-produced to low-cost content. Why it matters: Facebook is officially going after the TV market. 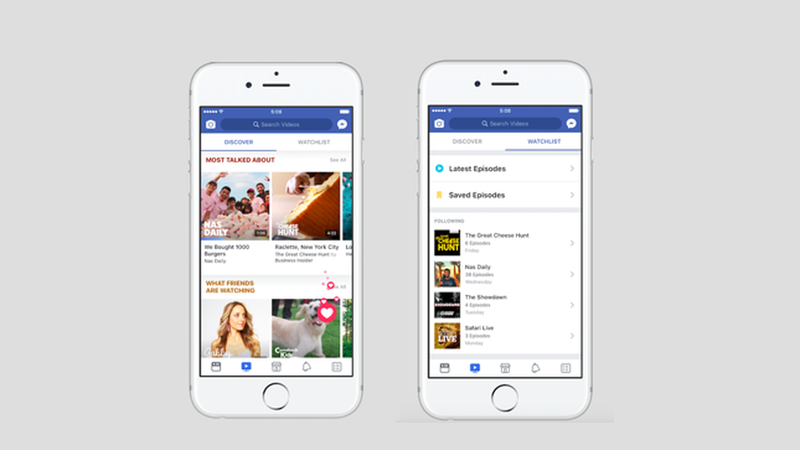 It will offer users access to TV-like shows that they can watch on any screen, and it will allow Facebook to win over ad dollars typically spent on cable and broadcast. It's also another copycat feature that will likely slow Snapchat's user growth and audience engagement. Nas Daily will be a daily show where Nas makes videos together with his fans from around the world. Gabby Bernstein, a New York Times bestselling author, and motivational speaker will use a combination of recorded and live episodes to connect with fans and answer questions in real time. Tastemade's Kitchen Little that will feature a new child, a new chef, and a new recipe each episode. League Baseball is broadcasting a live game weekly on Facebook. Quartz will be presenting several shows that follow compelling characters and groundbreaking science shaping the future of the global economy. The Atlantic is creating two new video series for Facebook's Watch platform that will release this fall. They also expect to make other Atlantic Studios content -- like their regular series like You Are Here and Unpresidented, or longer documentaries -- available on Watch. Cheddar announced that it will have a Show Page on Facebook's new Watch platform that will be rolled out to users in the coming weeks.